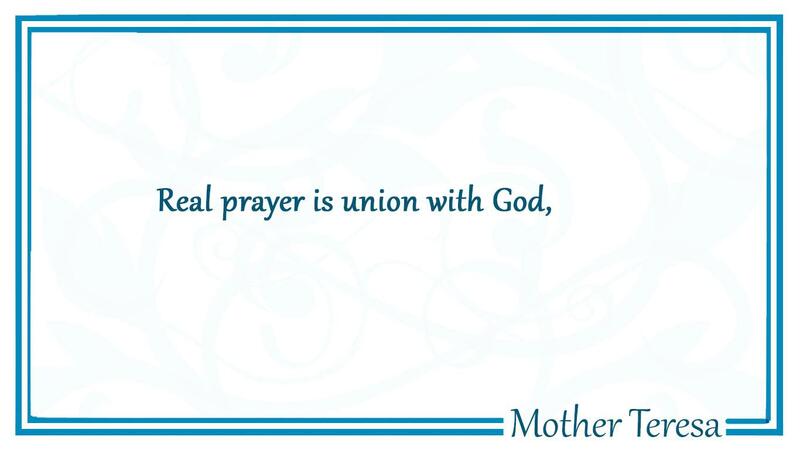 Real prayer is union with God. People are unreasonable, illogical and self-centered. Love them anyway.... Honesty and frankness make you vulnerable. Be honest and frank anyway. What you spend years building may be destroyed overnight. Build anyway. Give the world the best you have and you'll get kicked in the teeth. Give the world the best you've got anyway. We the willing, led by the unknowing, are doing the impossible for the ungrateful. We have done so much, with so little, for so long, we are now qualified to do anything, with nothing. Joy must be one of the pivots of our life. It is the token of a generous personality. Sometimes it is also a mantle that clothes a life of sacrifice and self-giving. A person who has this gift often reaches high summits. He or she is like sun in a community. One thing will always secure heaven for us-the acts of charity and kindness with which we have filled our lives. We can do no great things, only small things with great love. There are some people who, in order not to pray use as an excuse the fact that life is so hectic that it prevents us from praying. This cannot be. Prayer does not demand that we interrupt our work, but that we continue working as if it were a prayer. It is not necessary to always be in meditation, nor to consciously experience the sensation that we are talking to God, no matter how nice that would be. What matters is being with Him, living in Him, in His will. To love with a pure heart, to love everybody, especially to live the poor, is a twenty-four hour prayer. Let us be very sincere in our dealings with each other, and have the courage to accept each other as we are. Do not be surprised or become preoccupied at each other's failures - rather, see and find in each other the good, for each one of us is created in the image of God. My prayer for you is that you may grow in the likeness of Christ, being real carriers of God's love and that you really bring his presence, first, into your own family, then, to the next door neighbor, the street you we live in, the town we live in, the country we live, then only, in the whole world, that living example of God's presence.